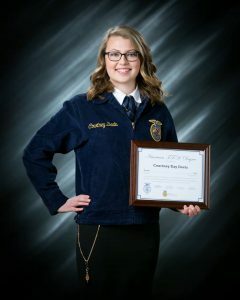 Courtney Davis, NHS Class of 2016, was awarded the American FFA Degree at the 91st National FFA Convention held in Indianapolis, Indiana. The American FFA Degree is the highest honor bestowed upon any regular member of the National FFA Organization with less that one percent of FFA members receiving the award. Davis maintained a diversified Supervised Ag Experience Program that included four state fair tractor restorations, working on her family’s corn and soybean farm, working part-time at Van Wall Equipment, Syngenta, and the Iowa State Agricultural Entrepreneurship Initiative. Davis also completed an agronomy sales internship in the summer of 2017 with KEY Cooperative followed by a marketing communications internship with Ag Leader Technology this past summer. Davis is currently a senior at Iowa State University majoring in Agricultural Studies with minors in both Entrepreneurial Studies and Agronomy. Courtney is the daughter of Troy & Deena Davis of rural State Center. Her agriculture education instructor & FFA advisor is Kevin Cooper of Nevada High School.